ART OF TRANSIT — Click above to see a larger version; black and white version after the jump. 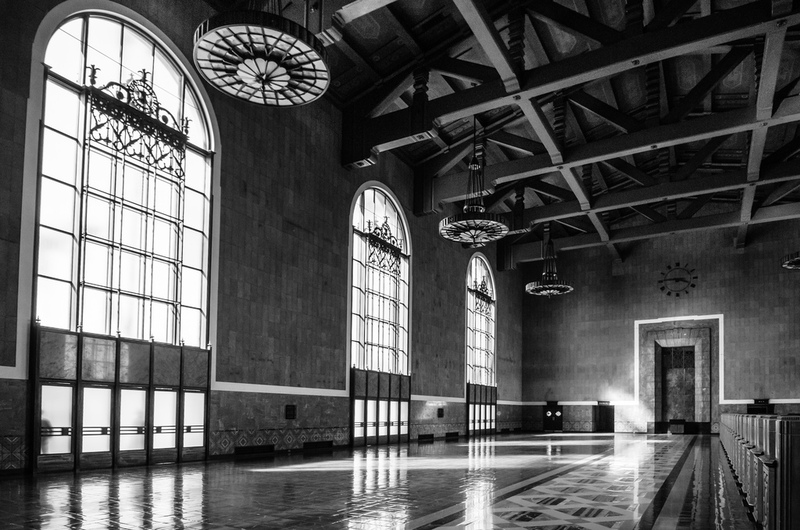 I was walking through Union Station last week with camera gear in tow and noticed some very nice late afternoon light on the old ticket room at the front of Union Station, used these days mostly for special events and filming. 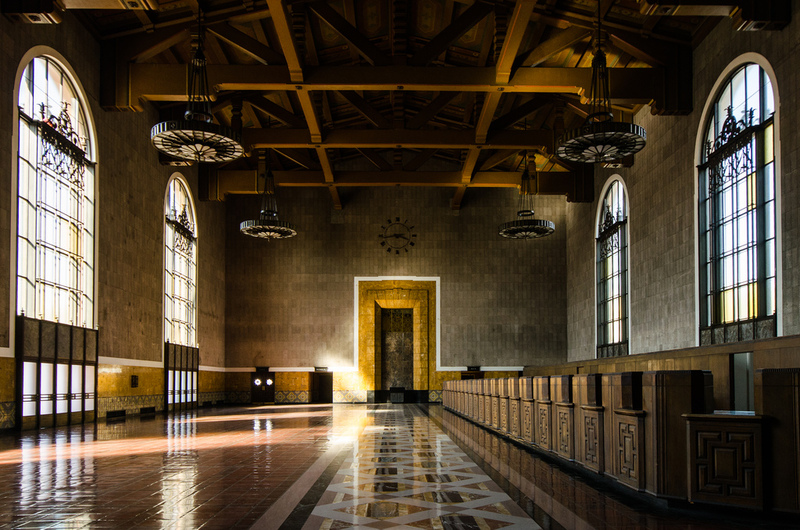 It will be interesting to see what is recommended for the gorgeous old room in the ongoing Union Station Master Plan process. We’ve had a couple of recent posts on the plan: a powerpoint on early findings by the architectural team in charge of the plan and a Metro staff report explaining that making Union Station work as a transit hub is the first priority of the plan. Both are very interesting. Thoughts on how you would like to see the old ticket room used? Comment please! Photo by Steve Hymon/Metro. The last of architecture critic Christopher Hawthorne’s series on major streets in the region and how they are changing (or in some cases not) with the times. Because UCLA isn’t subject to local zoning or height limits, it could build atop the subway stop a very tall tower holding classrooms, apartments and even a museum or auditorium. “We have a temporary building there now, but we do see this as a key site for UCLA in the future,” Jeffrey Averill, UCLA’s campus architect, said in an email. So do other architects, who look at the chance to design a tower on Lot 36 as the commission of a lifetime. When the Getty Center opened on a Brentwood hilltop in 1997, inside a luxe billion-dollar campus by the architect Richard Meier, LACMA seemed to be falling even further behind in the chase for attendance. The Getty was right next to the 405 Freeway, after all, near the epicenter of Westside wealth. Fast-forward 16 years and the conventional wisdom has dramatically changed. As became clear during the two recent Carmageddon shutdowns of the 405, when the museum was forced to close, the Getty’s reliance on the freeway system has become a liability. LACMA, on the other hand, will enjoy a new centrality once the Purple Line reaches Wilshire and Fairfax 10 years from now. It will likely get another boost in attendance when the subway is extended west to Rodeo Drive by 2025 or so. Give the article a read – it’s very thoughtful. I also think that it’s inevitable that the subway will spur investment and some development near the new stations. As the real estate values rise near the stations, hopefully more investment will spread down to other parts of Wilshire that could use a boost. And while on the subject, which pencilhead in City Hall decided strip malls along Wilshire were a good idea? Really? REALLY? After three years of significant gains, the number of cyclists counted at six survey locations during the traditional riding season was flat last year, according to the city’s annual count. As with other places, one of the key questions bouncing around in New York is how many cyclists are actually using the new bike infrastructure aggressively installed under Mayor Michael Bloomberg. The mayor’s office says that thus far this year they are seeing more people riding and the traditional count didn’t include some places where new bike lanes were installed. It would be great to see a survey here across the region to see which bike infrastructure is being used and which isn’t — the idea being that perhaps the lanes not being used need to be modified to attract more riders. I’m talking to you, Venice Boulevard bike lanes! Despite a plan adopted in March 1973 to give priority to transit, the bulk of San Francisco’s streets are still used to operate and store private vehicles, sometimes leaving little space for transit, pedestrians and cyclists, writes Streetsblog. Good post with some great photos and other visuals. Some interestingness: in San Francisco, about 45 percent of people drive to work and about 33 percent take transit — rates that stand apart from most other large American cities in which many more people drive and fewer people take transit. I’d like to see the room kept usable for special events and filming. 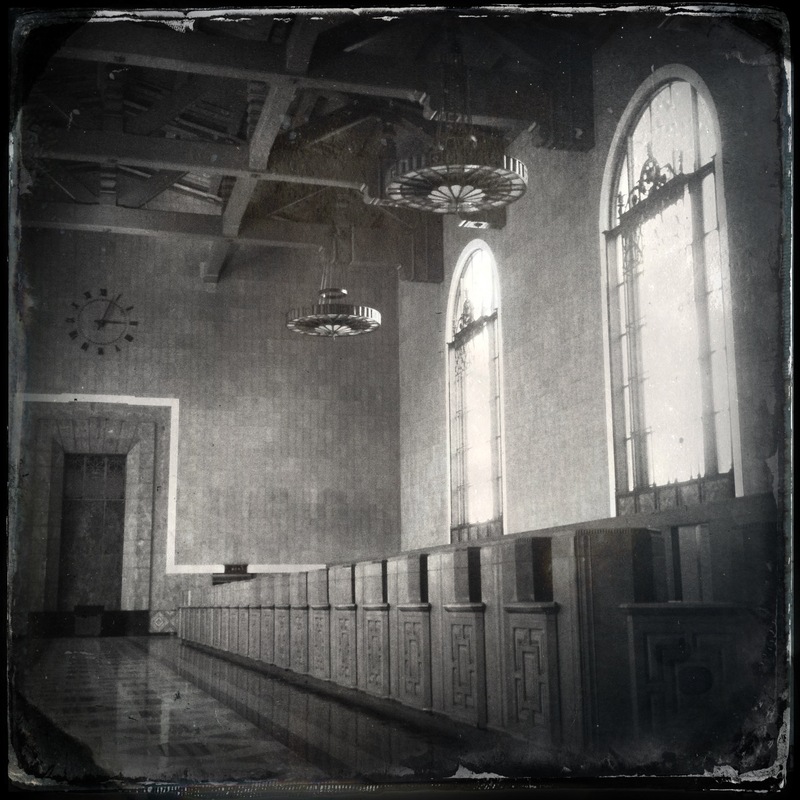 Filming locations are part of LA’s mystique. I recommend a small transit museum with exhibits/posters, etc. that could be easily removed and stored when the room is rented out. Union Station needs a destination theme park area and this is the perfect place. (Maybe there could be some kid-oriented things out in the courtyard?) Maybe a geocaching/treasure hunt approach? There are a lot of problems with the Venice Blvd lanes. Venice is so busy and cars travel so fast on it. For a lot of stretches, the lanes are not wide enough: cars in the right lane naturally end up very close to cyclists. The whole thing is in the door zone, and the street parking there is very well used. And, don’t get me started on just general road conditions, especially where the lanes are (the surface in the bike lanes see even less maintenance and consideration than what is already a poorly maintained road). On top of all this, they’re going to be a mess near Robertson Blvd for the next several months/years while the Expo line is extended across Venice Blvd. It’s a shame because these lanes have a potential to be one of the best cycling resources in the city. Once the lanes are extended from Crenshaw, we’ll finally have continuous cycling infrastructure connecting the west side to downtown. But until they can live up to that potential, they need to be made to be friendly to cyclists. Protecting bicycles from auto traffic would go a long way to encourage ridership. A technique like the separated cycle track being considered for Figueroa between Expo Park and LA Live is a good approach. I’d even wager it could be done without removing a lane of parking or traffic. I agree — ton of potential there as Venice is generally a pretty flat route and there’s lots of interesting things along the way. I think you hit the nail on the head with the issues — and I just don’t think it’s a great idea to put bike lanes directly adjacent to three lanes of traffic without some type of separation. The city of L.A. just did the same thing on Huntington Boulevard between Mission and Alhambra and the results are much the same as Venice Boulevard: few people are using the lanes. Of course, that leads to another problem: backlash. If motorists are already unwilling to accept bike lanes in some places, it just gives them even more fodder when they see an empty one. Important stuff and it’s sad to see how much of the intelligent discussion on the cycling issue has escaped the mainstream media. Thanks for reading, riding and commenting! There’s a danger for cyclists on Venice Blvd because there are now increasing number of scooterists who are starting to share the use of the bicycle lanes. Traffic jams on Venice as well as most of West LA has become worse to a point that there are increasing number of people looking for alternative ways to travel within that area. Scooter shops are popping everywhere because it provides the cheapest and most fastest form of transit for short travel needs within West LA. But the scooter salesmen seems to be giving out false info that scooters can skip by the car traffic and are able to use the bicycle lanes because the engines are small enough. There needs to be more enforcement and education done to prevent scooterists from using the bicycle lanes. They are to be using the general traffic lanes, not the bicycle lanes.